It's the year 2031--one generation removed from Sept. 11, 2001--and Americans are commemorating the 30th anniversary of the terrorist attacks on New York City and Washington. 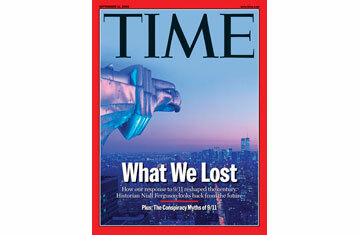 How well did America respond to that day, when viewed with the benefit of hindsight? How has history judged our leaders' actions? Here, a historian looks back on that distant event and explains how 9/11 would change America, and the world, in ways that few could have imagined. Nineteen terrorists. Four hijacked aircraft. Nearly 3,000 victims. It all happened in little more than an hour, between a quarter to nine and 10 in the morning on Sept. 11, 2001. But the war that started that day was destined to last years, many years. At first they called it the Global War on Terrorism. In time, historians rebranded it the Great War for Democracy. It was a conflict that changed forever the face of the Middle East. It was a war that fundamentally altered the international balance of power. But it was far from clear that those shifts were favorable to the U.S. Some pessimists, with the benefit of hindsight, suggested that the years after 9/11 marked the beginning of the end of the American Century. But others maintained that it was the beginning of a different kind of American Century. No question, 9/11 was an act of war. But was the U.S. reaction to it the right one? In 2006, five years after 9/11, the answer to that query still seemed unresolved. According to a TIME/Discovery Channel poll taken on the eve of the anniversary, nearly 70% of Americans believed the war against terrorism would not be won within 10 years. But looked at from the vantage point of 2031--three decades after the terrorist attacks on New York City and Washington--the debate is over. Thirty years later, the Great War for Democracy has been won. And not many people in 2006 would have predicted the winner. The significance of a traumatic event like 9/11 changes with the passage of time. On the fifth anniversary of the attacks, memories were still fresh; to those who lived through that day, it was unfathomable that three decades later many Americans would have no memory at all of what happened back in 2001. As a 67-year-old writing in the year 2031--at an age that used to qualify me as a senior citizen before that term was banned as ageist, and before the standard retirement age was raised to 80--I can still remember 9/11 pretty clearly. But today 1 in every 3 Americans is under age 30. And so I had better explain why I think the attacks constituted the first battle in a War for Democracy. It was a new-style democratic war from the very outset because the enemy chose as its targets not masses of troops or military installations, as in traditional war, but U.S. civiliansordinary people going about their business on planes, in tower blocks, in government offices. And it was democratic because the perpetrators took advantage of the very freedoms inherent in democracy to lay their murderous plans. It was democratic too in the sense that the U.S. was able to wage a war of retaliation with minimal coercion of its own citizens. There was no draft, no censorship of the press and--a first--no economic squeeze to pay for the war. On the contrary, Americans were told it was their patriotic duty to carry on consuming.